Pistachios is rich in vitamins that is essential for anti wrinkles. Olive Oil is rich in Vitamin E and A which fight the radicals free. It is anti oxidant that reduce wrinkles and lines. Soap, Moisturizing Cream (Day + Night), Lip Balm. Eye Contour. Goat’s / Camel Milk Soap which fight wrinkles and line, gentle exfoliate the dead cells and whitening the skin naturally. Moisturizing Day Cream and Moisturizing Night Cream to make your skin hydrate always. Lip balm to prevent lip dryness which make lips ageing very fast. Eye contour because eyes area need special care. It is the most sensitive skin in the human body and wrinkles appear around the eyes very fast. There is nothing working good for body like shea butter products. Shea butter is wonderful natural anti aging. Ladies in Africa use it for wrinkles and sun burns. Exfoliating is simple funny technique to refresh the body. It helps reducing the wrinkles because it remove the dead cells and allow a new healthy layer to grow. It make your body glow, smooth and healthy. Skin Line products (Skin B and Skin R), a natural and effective solution to collagen skin aging. No side effect. Visit our anti aging section in face and body page to learn more. After 40, your hair will grow slower than before. You will notice that your hair is thin. Using natural hair products like shampoo and hair oils will help your hair to stay healthy. Relax More, Stress Less. Your brain, just like your body, needs downtime. It performs best after you give it even just a little time to relax. 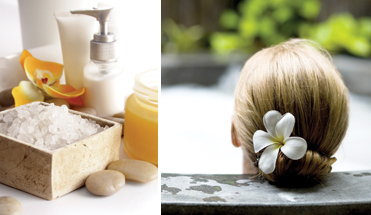 Use one of our body massage products to enjoy the experience.